An Auto transformer Starter is suitable for both star and delta connected motors. In this method, the starting current is limited by using a three-phase auto transformer to reduce the initial stator applied voltage. 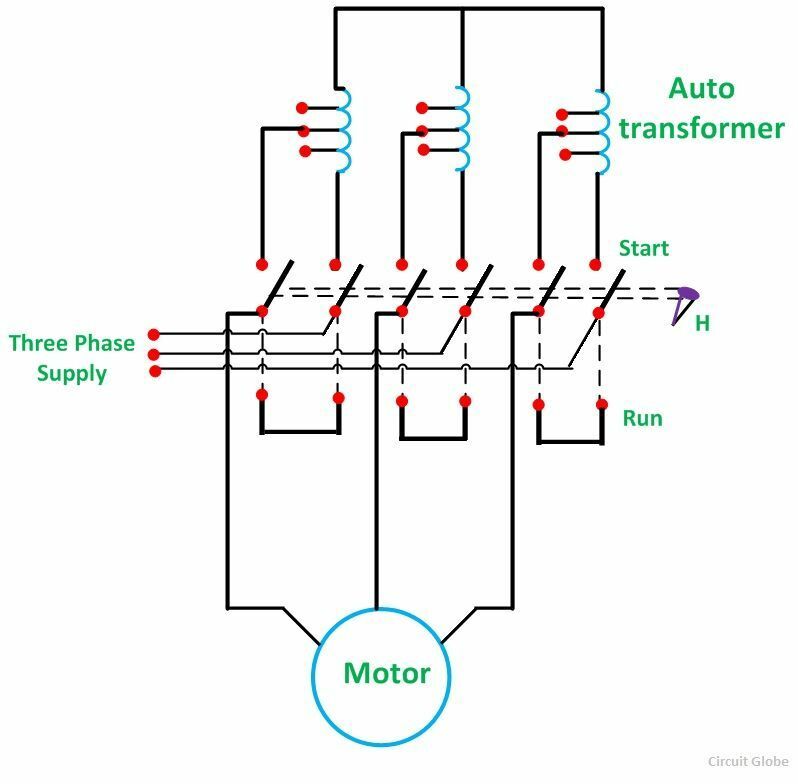 The figure below shows the motor with the Auto transformer starter. It is provided with a number of tappings. The starter is connected to one particular tapping to obtain the most suitable starting voltage. A double throw switch S is used to connect the auto transformer in the circuit for starting. When the handle H of the switch S in the START position. The primary of the auto transformer is connected to the supply line, and the motor is connected to the secondary of the auto transformer. When the motor picks up the speed of about 80 percent of its rated value, the handle H is quickly moved to the RUN position. Thus, the auto transformer is disconnected from the circuit, and the motor is directly connected to the line and achieve its full rated voltage. The handle is held in the RUN position by the under voltage relay. If the supply voltage fails or falls below a certain value, the handle is released and returns to the OFF position. Thermal overload relays provide the overload protection. The figure (a) shown below shows the condition when the motor is directly switched on to lines and the figure (b) shows when the motor is started with the help of auto transformer. V1 is the supply voltage per phase. When the full voltage V1 per phase is applied to the direct switching, the starting current drawn from the supply is given by the equation shown below. 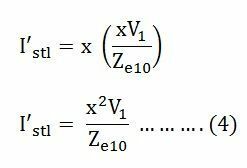 With auto transformer starting, if a tapping of the transformer ratio x is used, then the voltage per phase across the motor is xV1. Therefore, at the starting, the motor current is given by the equation. Substituting the value of Istm from the equation (2) in the equation (3) we get. With the auto transformer, at the starting, the motor current is given by the equation shown below. The above equation (5) and the equation (8) shows that with an auto transformer, the starting current I’stl from the main supply and the starting torque are reduced to the x2 times to the corresponding values with the direct online starting. Thanks sir, great explanation …. Why we do use auto transformer starter when there is a cheap alternative, star-delta starter is also available.